文献来源：Ye, Y. & van Nes, A. (2014) “Quantitative tools in urban morphology: combining space syntax, space¬matrix, and mixed-use index in a GIS framework”, Urban Morphology, Vol.18, No.2, 97-118. 城市活力（urbanity）。城市活力是城市设计的重要目标之一。这一概念的表述相对纷繁，但总的来说可以被理解为一种基于城市空间形态影响的城市活动。换言之，城市空间活力是一种空间特征及其背后社会活动的同构体，可以从空间形态特征和居民活动强度，特别是杨· 盖尔（Jan Gehl）所定义的“选择性活动”（optional activities）强度这两方面进行界定。随着城市空间品质日益受到关注，对于这一概念的探讨也逐步增多，有兴趣的读者还可以查阅：Lees L. (2010). 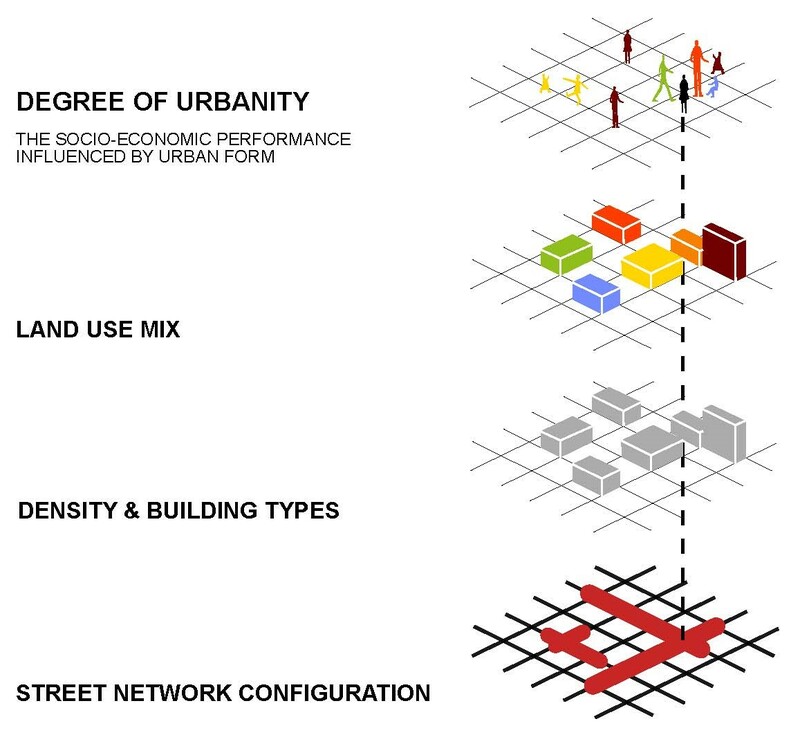 Planning Urbanity? Environment and Planning A, 2010, 42(10): 2302-2308 或 Westin, S. (2011). The Life and Form of the City: An Interview with Bill Hillier. Space and Culture, 14(2): 227-237.